TrayScript allows you to run batch file style scripts from the System Tray. Categorise your scripts and build new scripts quickly and easily. Folder Scout is an useful application that gives you instant access to any Local/Net Drive, Folder or File on your computer. Folder Scout avoids everyday tedious folder tree navigation and searches allowing you to focus on just your important tasks. The DOS program notes, at which times on which days the computer is switched on and provides a statistic from this information. The frequency of use of the computer is plotted graphically. New update! EaseUS Partition Recovery is a free and easy-to-use partition recovery software to quickly recover deleted or lost FAT, NTFS, Ext2/Ext3 partition in Windows 2000, XP, 2003, Vista, 2008, Windows 7. Get data back from lost partition now! RunitAs runs an executable using the specified credentials (domain, user and password) from a limited or guest account. Similar to the Windows RunAs function with more features. Don't let rogue software take over your file associations. Open files your way! Associate This is a file extension manager that works behind the scenes to protect your system from software that changes your file associations without your knowledge. ProcessKO is a small useful tool to quickly kill a running or hanging process / program.Creating "Dearest-KO's" for fast killing processes or programs! One can save many hand moves and also time ! ProcessKO does not have to be installed. MING Bandwidth Monitor PRO is a powerful bandwidth monitor, which measures and displays all traffic to/from any process, your computer or your network. It shows you how much traffic that is, over which IP ports this traffic uses, and where it goes. Insert text or execute any file by pressing a shortkey defined by yourself. Use any character, any figure or one of many other keys from your keyboard. Just combine that one with SHIFT, ALT, CTRL or with Windows key, with more or with all of them. Simple Todo list with powerfull filtering capability. Archive done items, add notes to Todo items, Add child items to Todo items, sort on headers. Has priority, percentage complete, responsible person and category. 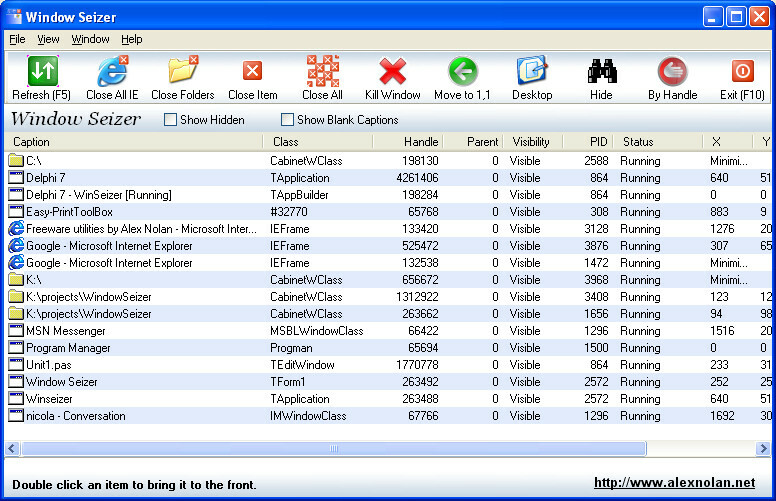 Window Seizer - Take control of your open windows and tasks. This site does not contain serial number, crack, keygen TrayScript serial number : serial number is the simplest type of crack. A serial number(cdkey,product key,etc) is register the program as you may already know. a crack or keygen may contain harmful software. If you cannot find the exact version you want, just give it a try. for more information read .nfo/.txt/.diz file include in zipped file.